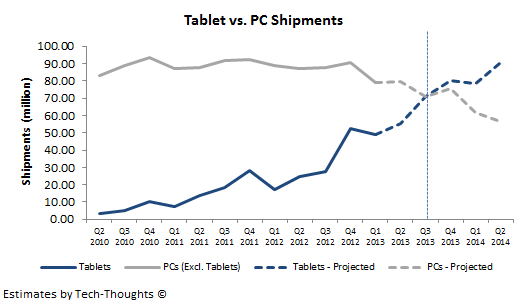 A few months ago, I had estimated that tablet shipments would overtake PCs by Q1 2014. This was based on the fact that the substitution rate pattern of tablets vs. PCs was similar to the one we saw in the early days of the modern vs. legacy smartphone battle. Let’s use the tablet & PC shipment data from Q1 2013 to revise our estimate. 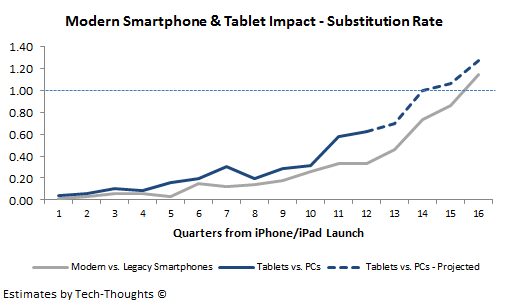 The tablet vs. PC substitution rate in Q1 turned out to be much higher than my estimate. This was partially driven by quicker adoption of tablets in emerging markets, and a major decline in PC shipments (thanks to tablet adoption and consumer response to Windows 8). While tablet vs. PC substitution rate is currently considerably higher than that seen for modern vs. legacy smartphones, the two patterns show a correlation of nearly 95%. In order to be conservative, my original estimate assumed that the deviation between the two substitution rate patterns would decline over time, i.e. 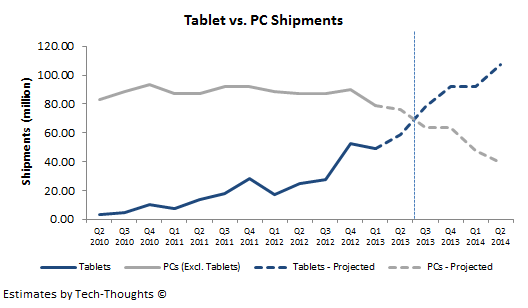 the growth in tablet vs. PC substitution rate would slow over time. However, at least for now, it seems as though that assumption may not necessarily be correct. Therefore, it may be more prudent to consider two cases: One where the deviation between the two trends narrows and one where it doesn't. As the chart above shows, Q4 2013 would be the first full quarter in which quarterly shipments of tablets would exceed those of PCs, as PC shipments drop to ~70-75 million and tablet shipments near 80 million. 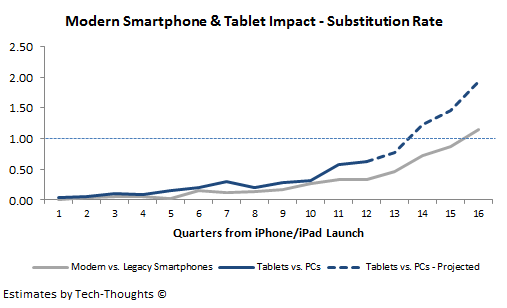 In this case, the crossover between tablet and PC shipments occurs earlier, i.e. 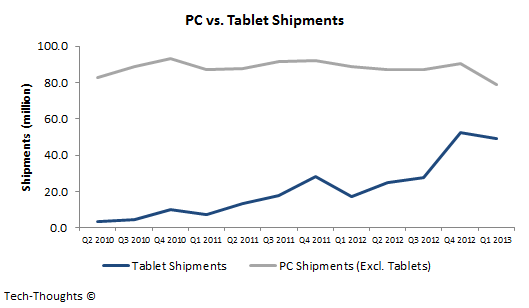 in Q3 2013, as PC shipments drop to roughly ~65 million and tablet shipments cross 75 million. While there isn't much variation in the point of crossover, the PC shipments drop much faster in the second case. These shipment estimates could be affected by the pace of of low cost tablet penetration in emerging markets and any changes to the Windows 8 operating system. However, given the scale of the figures, I can say with confidence that quarterly tablet shipments should overtake those of PCs by late 2013.
how are analyst counting touch 'convertibles' with Windows 8? Tablet or PC? So far, most research firms have been counting devices with attached keyboard under PCs, and those with detachable keyboards, under tablets. However, Windows 8/RT tablet shipments are still under 2 million as per their figures, so they aren't close to making up for the PC decline. One more question... Is there any data available on percentage Windows shipment that is used for business purposes. By business I mean not only corporate purchases, but also individuals buying for business needs. Thanks. Off the top of my head, I don't remember seeing any data on shipments for business users. However, I do know that the enterprise PC install base was about 500 million vs. 1.6 billion total, in 2011-12. Overall, it shouldn't make a huge difference until the shipment figures reach far lower levels. The current generation of business PCs are good enough to elongate the replacement cycle and new PC purchases in that segment are a fairly small proportion.